Health has again been an issue for us during 2016 so we were so excited to be able to make the decision mid August to enter the Canaries to Madeira Regatta. The Regatta is held every 2 years and originates from a different Canary Island each time. This year it would start in Lanzarote which, with the NE trade winds, would make for a good run back to Funchal. The appropriate entry forms were completed, insurance checked, equipment checked and we were ready to go. There was to be 5 of us on board - one of our regular crew was unable to join us due to work committments. We were so pleased when we received an email from one of the local sailors who wished to join us. I'm not sure he quite knew what he was getting into; being in his 20's on board with a bunch of 'older' people. But, at the end of the day, it all worked out great and we have a new friend who we appreciate so much for his personality and talent. Being my first visit to the Canary Islands I was excited to visit the place that I often heard talked about when co-workers went on summer holidays. 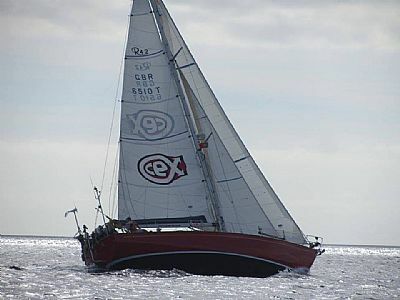 We planned to leave on 31st August and head down to Lanzarote via the Selvagen Islands, leaving us a couple of days in port before the race start. The local sailing association had arranged a welcome dinner on Friday evening. Skippers were fed in a different part of the club but it wasn't long before they all migrated through to join their crews. The association also arranged a bus tour around the north of the Island for the visiting crews, so we had an amazing chance to see the Island and visit a vineyard. I have to admit to being amazed by the way they plant their grape vines - dug down into a hole in the ground, the soil covered up with black volcanic gravel and a little half moon wall built. All this to attract and keep the humidity in the soil. It looks a bit like a lunar landscape. In true Madeiran/Spanish fashion a good 'shindig' was held on the Sunday evening. Loads of food, drink and music. We spent Monday visiting the chandlers to obtain some 'missing' spares - our flag and flagpole went flying into the sea just as we left Madeira! We participated in the Santa Cruz Regatta with only 4 crew members. Peter was back on board as Skipper and enjoyed being back on the water. Winds were predicted to be around 20 - 25 knots and we did hear some radio chit-chat at the start line about the weather conditions. We had a great time and recorded winds at 49 - 50 knots so we were sailing with our main reefed, genoa reefed and the stay sail out. Red Ruth enjoyed herself and brought us in across the finish line in 2nd overall position and 1st in class! After missing the March Regatta we were looking forward to the CEX/ARVM sponsored 3-day Regatta. This was held in Funchal so we had to take Red Ruth through from Quinta de Lorde Marina to Funchal, where a berth had been organised for us in the new Marina. The weather over the weekend was perfect with winds from the North and North-East between 15 and 25 knots. The sea swell was less than a metre and the sun was shining! Peter was unable to sail over the weekend so Lorraine was Skipper for the 3 days. Along with our regular crew members we had a few additional crew members who assisted us. This meant that we had a full compliment of 5 crew each day. with a 'lady' skipper we were pleased to have two additional ladies join the crew on the third day. Day 1 was sailed on a course between Garajau and Santa Cruz. The course was 32nm and unfortunately we ran out of time to complete the course. We ran out of time at the penultimate buoy! By the time we arrived back at the Marina in Funchal we had been out on the water for 8 hours. As a result the glass of cold beer was more than welcome when we arrived ashore, along with the news that out of 13 boats, 7 had run out of time - that salved out souls a little. Day 2 was two short technical courses, each of around 5nm. The course was upwind and downwind. Our starts were better giving us a few extra minutes on our time, we had a good winds over the course and finished the day with a 3rd in class on both races and 7th overall (out of 13 boats). The afterparty allowed us to relax with the other teams and to enjoy swapping stories. Day 3 incited some debate amongst the other teams who felt that the course on Day one had been too far away from Funchal and with winds that were too strong! The final decision was to set the course in the Bay of Funchal with approx 7nm round the buoys. Again it was upwind and downwind. We took the tactical option of changing from fewer tacks to a straighter run with lots of tacks, including an emergency tack to avoid another yacht. It was hard work for the team and we finished in 9th overall place (out of 14) with a 3rd in class again. Immediately following the Regatta we motor sailed Red Ruth back to our home Marina, arriving back in Funchal in time for Prize Giving and Dinner. The whole weekend was spectacular and the sponsors CEX (www.webuy.com) and the organisors have to be thanked. We thoroughly enjoyed ourselves. The first Regatta of the season took place from our 'home' Marina - Quinta do Lorde. The crew were kitted out with new T-Shirts for sailing (our working shirts). Our prize giving and formal shirts were handed out at the end of 2015. The 'Motley Crew' did very well in a course that took them up and down the bouys before heading west/east a couple of times before crossing the finish line. A tactical move to 'goose-wing' after rounding the first bouy saw them make up 4 places at that point. This proved beneficial with a 4th overall place and a 2nd in class. The support team (the ladies) were on shore to take the pictures of Red Ruth with her newly painted hull slicing through the surf! We got a few of the crew as well!! As you can see it was a great start to the season for us. Next Regatta in March.